The Prélude, Adagio et Choral varié sur le thème du «Veni Creator», Op 4, the first of the three major organ works, opens with the flute stops spinning a fine web of sound based on the opening phrase of the plainsong melody. A reed stop in the pedals announces a contorted version of the second phrase of the plainsong theme. The triplet figure returns on the flute stops before the third phrase of the plainsong is adapted. The reed stop returns before the fluttering opening triplet figure brings the Prélude to a close. A short section marked ‘Lento, quasi recitative’ leads into the Adagio proper which starts in G minor and moves unpredictably to G major before plunging into the key of B flat minor where a darker mood gradually assumes more prominence. 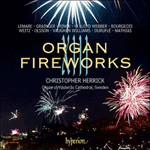 This passage may well be Duruflé’s finest for the organ: the music becomes increasingly chromatic and the transition from the opening Adagio to the climax is achieved in the most seamless manner. Finally the Choral which has only been seen through a glass darkly, as it were, is presented in full by the organ, and followed by the four variations. Né à Louviers, près de Paris, Maurice Duruflé (1902–1986) fut formé à la cathédrale de Rouen et étudia avec Paul Dukas au Conservatoire de Paris avant de tenir l’orgue de Saint-Étienne-du-Mont, de 1930 à 1975. Voulu comme un «affectueux hommage» à Louis Vierne, son Prélude, Adagio et Choral varié sur le thème du «Veni Creator» op. 4 parut en 1931. 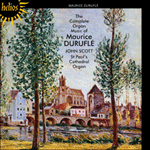 In Louvier bei Paris geboren, erfuhr Maurice Duruflé (1902–1986) seine erste Ausbildung an der Kathedrale von Rouen, studierte bei Paul Dukas am Pariser Conservatoire Komposition und präsidierte 1930–1975 an der Orgel von St.-Étienne-du-Mont. Sein Prélude, Adagio et Choral varié sur le thème du „Veni Creator“, op. 4, wurde 1931 veröffentlicht und ist als „affectueux hommage“ an Louis Vierne gedacht. the hearts thou hast created. the Spirit of Father and Son. In he last movement, Choral varié, Duruflé begins by presenting the well-known Whitsuntide melody in rich, diatonic harmony. In the first variation, a plangent Nazard combination is heard against the dark tones of the Cromorne; in the second, the theme is heard on a limpid Flute, its notes enfolded in a delicate eight- and two-foot registration; and in the canonic third variation a luxurious string sonority underpins the theme. The fourth and final variation, a scintillating toccata, brings the work to a conclusion of immense grandeur. Dans le dernier mouvement, Choral varié, commence par présenter la célèbre mélodie de Pentecôte dans une riche harmonie diatonique. Dans la première variation, une plaintive combinaison de nasard est jouée sur un sombre fond de cromorne; dans la deuxième, le thème, exécuté sur une flûte limpide, voit ses notes entourées d’une délicate registration de huit-pieds et de deux-pieds; dans la troisième variation canonique, une somptueuse sonorité de cords sous-tend le thème; quant à la quatrième, une scintillante toccata, elle conclut l’œuvre dans un immense grandiose. Hier beginnt Duruflé mit einer Präsentation der wohl bekannten Pfingstmelodie in reicher diatonischer Harmonisierung. In der ersten Variation wird eine klagevolle Nazard-Kombination den dunklen Tönen des Cromorne (Krummhorns) gegenübergesetzt; in der zweiten ist das Thema auf einer hellen Flöte zu hören, deren Noten sich in delikater Acht- und Zweifuß-Registrierung entfalten, und in der kanonischen dritten Variation unterstützt eine üppige Streichersonorität das Thema. Die vierte und letzte Variation, eine schillernde Toccata, bringt das Werk mit immenser Grandiosität zum Abschluss.